Another developer is joining the action at Miami Worldcenter. Chicago-based Fifield Companies filed plans for a 533-unit rental tower at the mixed-use project in downtown Miami. Fifield is proposing a 47-story, 738,000-square-foot building with about 15,000 square feet of retail space on the northeast corner of 10th Street and First Avenue. The developer will go before the city’s Urban Development Review Board next Wednesday. The building, designed by ODP Architects, would feature an amenity deck on the seventh floor with lap pools, a dog park, table tennis and picnic areas. The rooftop will have a sunset lap pool and sun deck. CIM Group and Falcone Group already completed Caoba, the first building at the $4 billion, 10-block complex. Rents at the 444-unit rental tower, at 698 Northeast First Avenue, start at about $1,800 for a 349-square-foot studio. The Forbes Company and Taubman Centers recently hired the Comras Company to partner on leasing the 300,000 square feet of retail, restaurant and entertainment space at the 27-acre project. 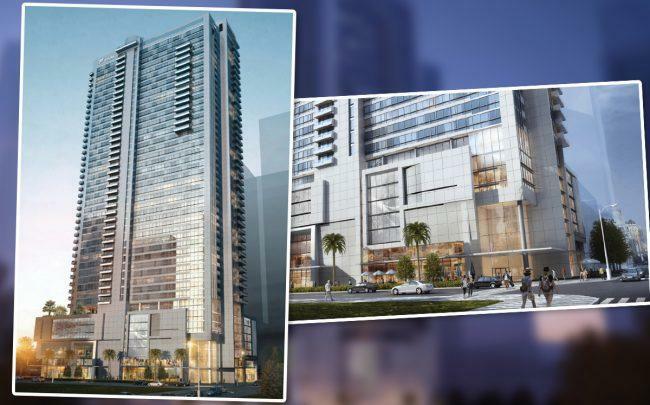 Next to be delivered is Paramount Miami Worldcenter, a 60-story condo tower with more than 500 residential units, which is 85 percent sold. It’s expected to open in May. Miami Worldcenter will also have a 348-room CitizenM hotel, a 434-unit rental tower from Zom, a 1,100-space parking garage, a 1,700-room convention center hotel from MDM Development Group and an office tower being built by Hines with up to 500,000 square feet of office space. In Chicago, Fifield is moving forward with plans to build the mixed-use Logan’s Crossing development with Terraco Real Estate in Logan Square.